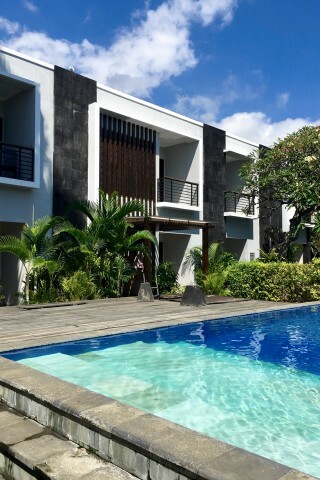 Padmasari Hotel is a fairly standard modern-style beachfront resort with a sensational large infinity pool looking out to sea, and the pick of a row of similar resorts along the strip west of central Lovina. Forget the poor value superior rooms which are small, roadside and have no view. Go instead for the deluxe or better, if your budget stretches. Rooms are mostly housed in a simple modern brick double-storey building overlooking the pool with a couple of suite rooms to the side. Interiors are spacious with minimalist modern dark furniture in neutral tiled rooms. It’s comfortable, inoffensive but a tad bland, equipped with all the amenities you would expect. Bathrooms are clean and fresh, but the rooms we viewed didn’t have tubs. The winner in this resort is the swimming pool — a vast square of seductive blue. A covered bale and umbrella-shaded sun lounges are appealing places to chill out. Grab a cocktail from the bar and watch the sun set over the Bali Sea. The on-site restaurant serves an included breakfast. While the restaurant is often not operational in quiet season for other meals, Padmasari Hotel operate a free shuttle bus to central Lovina where there’s a selection of restaurants, so you won’t starve. Check rates at Padmasari Hotel on Booking.com. ++. Super deluxe beach view: 660,000/830,000++ rupiah. Room: Deluxe double room, low season: 470,000 rupiah, high season 600,000 rupiah. Notes: ++. Super deluxe beach view: 660,000/830,000++ rupiah.